The sight of young girls lining up for a meal along the school corridor, the sound of them chit-chatting, the clinking sound of plates and silverware and the smell of Pineapple Mussel Curry...all are so clear in my mind, even so many years later. Pineapple Mussel Curry was served so often so that it etched in my memory. For me, the curry is synonymous with school. It’s a simple curry to make and it tastes sweet and sour, just what I crave for today. Pineapple Mussel Curry tastes exotic and delicious. Neither the pineapple nor the curry paste burns your tongue; this is the curry for kids and people enjoying mild Thai food. And for the novice cook, you can’t go wrong with this curry. Give it a go and taste Thailand. 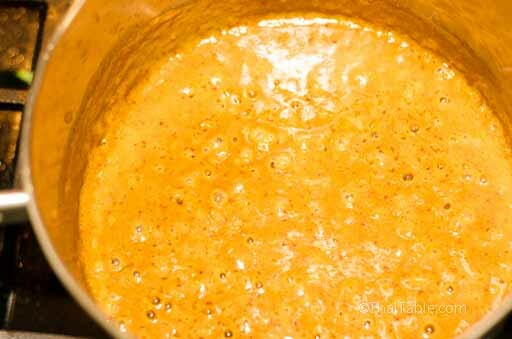 I use 2 tablespoons of my homemade basic red curry paste. If you’re using a store bought curry paste, it may be spicier and saltier. I’d recommend adding 1 tablespoon of the curry paste first. If you need to add more you can do it any time in the process. With this curry, we’re not aiming for lots of red oil floating. It should work out fine. You may not need tamarind and palm sugar. Frozen pineapple works well, too. Pineapple, like other natural products, varies in sweetness and sourness. For me, this batch of curry has a perfect balance of sweet and sour without additional tamarind or sugar. The Pineapple Mussel Curry is usually made with dried salted mussels but I found the frozen mussels in the frozen section of an Asian market. The mussels were shelled and cleaned, very convenient. The curry gets tastier if you let it sit. 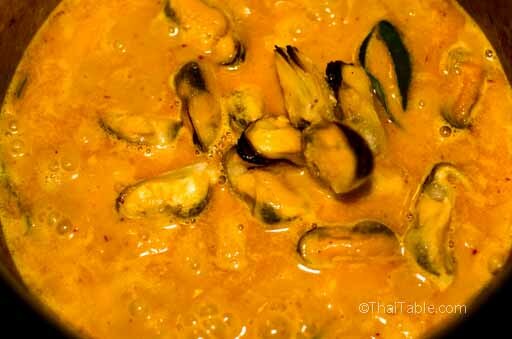 You can cook the curry the night before and add the mussels right before serving, preventing the mussels from shrinking. 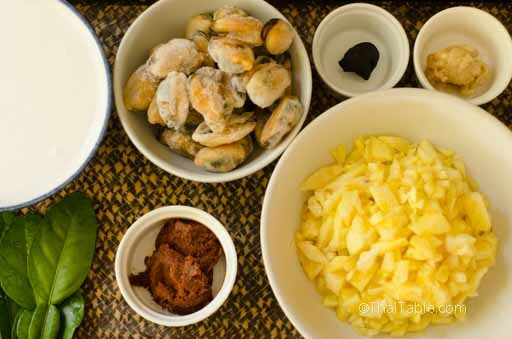 Like other Thai dishes, the amount of pineapple and mussels can vary to your liking. In this recipe, I use about 1 ½ cups of mussels (200 g or 7 oz). Chop the pineapple into small pieces so that it can easily absorb the spices. Please see our 2-minute video on how to peel and cut pineapple. Tear the center stems off from the kaffir lime leaves. Over medium heat, add half of the coconut milk to the pot. 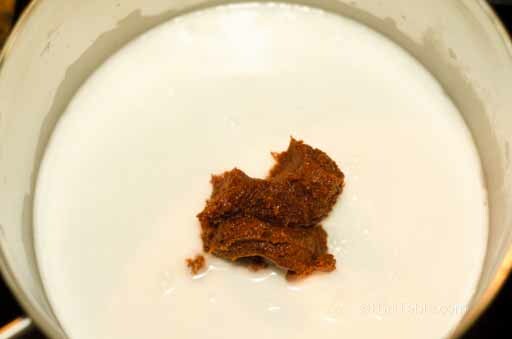 Add the basic red curry paste and break up the paste to mix it in with the coconut milk. Stir to prevent the bottom from sticking and burning. It should bubble up gently. You may need to lower the heat if it starts to splatter too much. 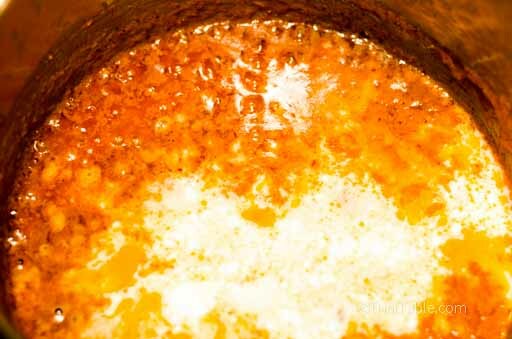 When you see red oil bubble up, add the rest of coconut milk and the chopped pineapple. Let the curry simmer for 5-10 minutes. At this point, the pineapple should be soft and full of curry flavor. The hot bubbling curry goes into the pineapple flesh pushing out the sweet and sour juice.The curry should have the pineapple aroma. Take a taste test. It should taste sweet and sour with a good balance of saltiness. You may need salt. If so, add salt and taste. With this batch, I didn’t need to add salt, sugar or tamarind. If you do need to add them, add a small amount first and taste to see if you like the flavors. 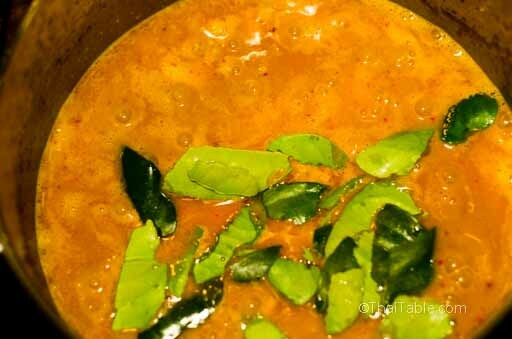 The curry should be orange in color, not bright red, and less oily than other curries. The amount of liquid should be less than in other curries. But you can add a small amount of coconut milk or water (your choice) if needed. Add the kaffir lime leaves and stir again. When you’re happy with the flavors and ready to serve, add the mussels and let it boil again before turning off the heat. 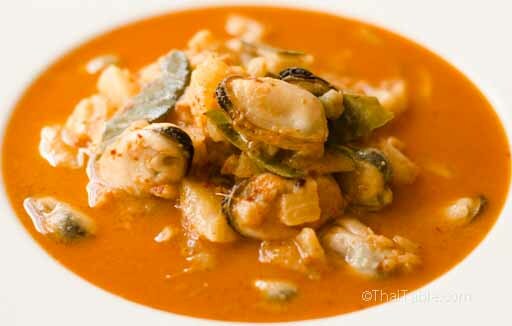 If you’re making the curry to serve later, add the mussels right before serving and let the curry boil again. This will keep the mussel shrinkage to minimal.